If you are experiencing bouts of itching, especially at night, you may be wondering, "What do bed bugs look like?" Not every itch or welt is a reason for concern, but continual nighttime itching and several bites clumped together could be. The best way to determine if you have bed bugs is to know what these insects look like. Bed bugs, or Cimex lectularius, are wingless insects that belong to the Cimicidae family. Bed bugs are small and oval shaped. Very flat, these flexible bugs can fit into small, strange shaped holes. Generally reddish brown in color, a mature bed bug measures five to seven milimeters long on average. They have compound eyes and antennae that they use for navigation. Bed bugs have six legs; two are at the front of their bodies and four at the back. These blood sucking bugs have a unique feeding beak that is tucked under their head when not being used. Learn what bed bugs look like from their infancy to their maturity. With this knowledge, you can identify bed bugs regardless of how young they are. Use a magnifying glass to search for bugs in their smaller stages. Bed bugs hatch from small white or yellowish eggs. Each egg is about one milimeter in length. The outer shell of the eggs has a sticky surface that makes them attach easily to anything. Mature egg layers will leave their eggs in small holes and crevices. It takes six to 10 days for the bed bug eggs to hatch. 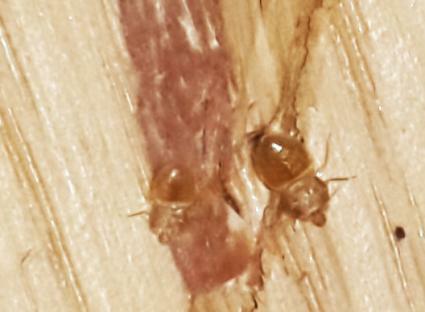 Once a bed bug hatches, it graduates to the growth stage known as a nymph. Nymphs are one-and-a-half milimeters long and remain white or yellow until the bug drinks its first bloody meal. After the initial meal, the translucent exoskeleton system will turn reddish brown. Nymphs develop through five stages. During their five nymph growth stages, the bed bug will need to feed at each stage. This process will last for approximately 35 to 48 days. During this period, the nymphs will continue to grow. Mature bed bugs may grow up to seven milimeters long. They are flat, reddish brown and have a segmented abdomen. During a female's lifetime of nine to 18 months, she can lay 200 eggs. Mature bugs can live for six months without food but have been known to live much longer. A good way to see what the bugs look like is to examine their carcasses. 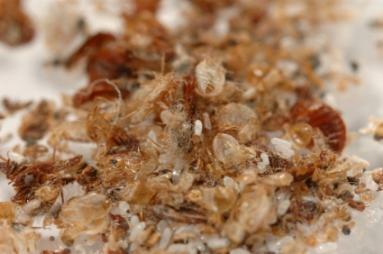 Bed bugs shed their skins as they grow leaving their outer shells behind. Pick up the suspected carcasses with a pair of tweezers. The abdomen section will be much larger than the bug's head. What do bed bugs look like? 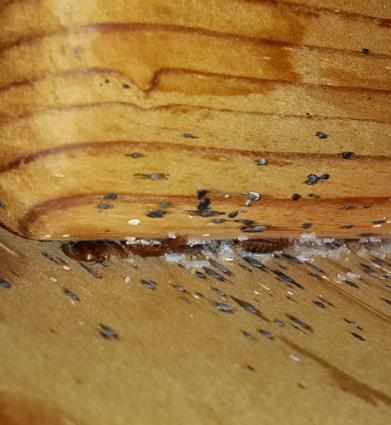 After hatching, bed bugs look essentially the same. They get larger as they grow, but keep their shape and color.